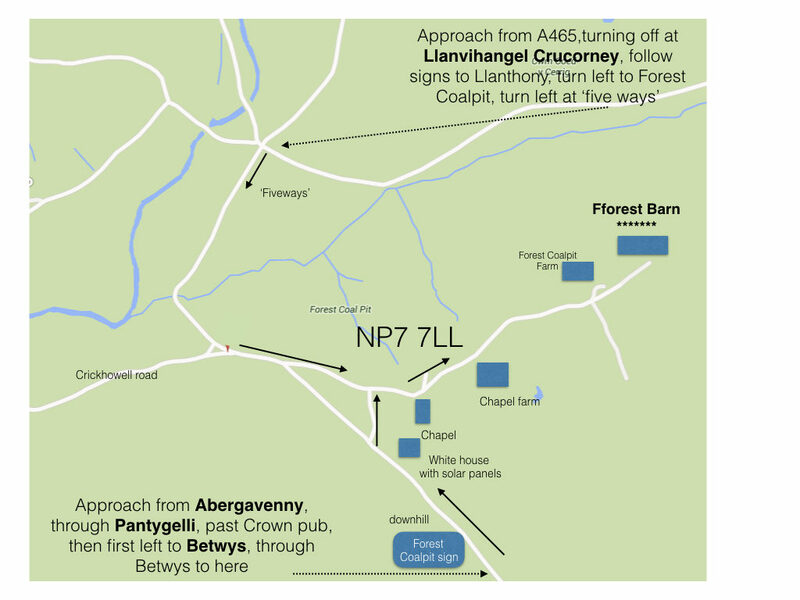 We’re about 10 mins from Abergavenny train station. If you’re coming by train you go from Paddington to Newport, then change for Abergavenny. This should take max 2.5 hours and cost circa £40. There are buses for under £10 to Newport, then take the train, or maybe bus all the way. There are also trains from Birmingham New Street, via Hereford. 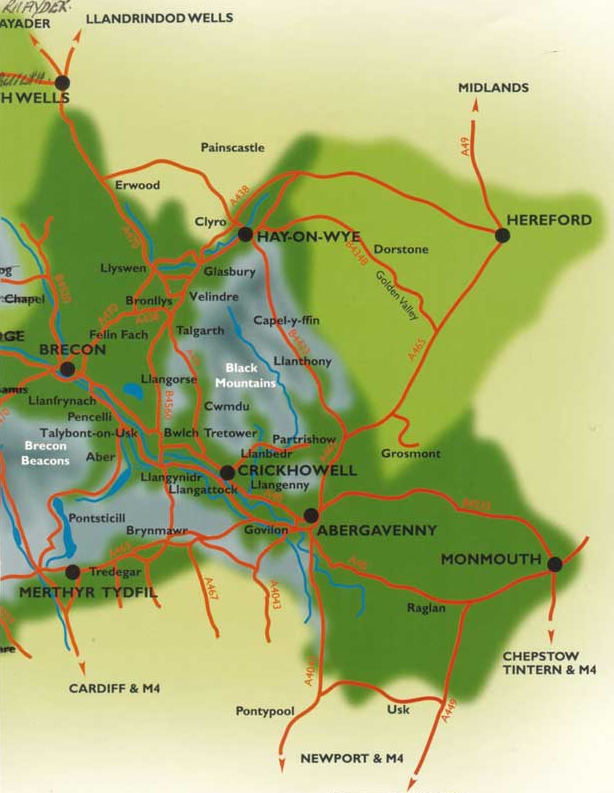 If you need a taxi to/from Abergavenny call Peter at A Cabs on 01873 737736 or 07958 702208. This costs around £10 one way. We are equidistant from Bristol or Cardiff Airport – about an hour away. A taxi costs about £120 each way – eg £60 each is two people. Call Peter at A Cabs on 01873 737736 or 07958 702208. Alternatively, you can hire a car at the airport. Wherever you are coming from head for Abergavenny. From London that means going on the M4, crossing the Severn Bridge, and turning off on junction 24 onto the A449. You’ll know when this junction is coming up because you’ll see the giant hotel The Celtic Manor Resort, on the hill in front of you. (Your SatNav might want to take you to the next junction, which is OK but slower.) After about 10 miles turn left at Raglan onto the A40 signposted to Abergavenny. If you are coming from the North (eg M5) take the M50 to Ross on Wye then join the A40 to Abergavenny. As you approach Abergavenny you’ll hit a roundabout. Take the fourth exit, not to Abergavenny, but to Hereford on the A465. Go along here for about 2 miles to Mardy, just past where the road becomes dual carriageway. You’ll see Abergavenny Fuels on the left. Turn left. Take an immediate right under the bridge. This is a very narrow road. As you proceed along this very narrow road, don’t take the first right (Great House Farm), but do take the second right, which will bring you onto the Old Hereford Road. Turn right. Soon you’ll come to Pantygelli, and the Crown pub on the left. Just after this the road forks. Take the left turning to Bettws and Forest Coalpit. Keep going, past the chapel in Bettws, up the hill and then the road starts to go more steeply downhill toward Fforest Coalpit. On the right is a white house with solar panels. Immediately after this turn right into a narrow lane. Don’t worry if you miss this. The next right will bring you to the same place in front of The Old School House. This is where the SatNav gets you to. Go to the right and keep going – past a chapel, a house on the left, Chapel Farm on the right, until you come to Forest Coalpit Farm. Keep going to the end of the road. You’ve arrived at Fforest Barn. There is parking for four cars, two undercover in the garage. For the disabled there is access to the kitchen patio avoiding the stairs down into the Courtyard. The Old Barn Pigstyle Bedroom has two steps down from the living room and kitchen, and two steps down into the en suite bathroom.